Hopefully you have noticed my absence from the blogosphere over the past week. I have missed sitting down and writing every evening and sharing my views with you. Over the past week, we have been visiting Daddy Drew's family in southern Missouri. It has become a tradition of ours to visit during one of our last weeks of summer and spend time with family since we do not get to see them as often as we would like. In our pre-baby days, we could make the driving in 9 hours or less, though now it seems to take a bit longer. We go kayaking with Drew's dad, antiquing with Drew's mom, the always anticipated dinner at Grandma's house, a birthday celebration for Drew's brother, Isabel's Uncle Steven, church, visits and meals with friends, etc etc. We have truly grown to feel at home in this tiny little town, even though Drew never actually lived here, and look forward to our twice yearly visits. This year, the theme seemed to be lineage, heritage, generations... Our visits are so far between that sometimes we do not realize how much people grow, age, and change in a 6 month period. That, and the fact that now we are introducing our daughter into our family traditions truly made this a special visit. Drew is quite blessed to have 3 of his 4 grandparents remaining. Grammy's mom is a very young 89 years old, though you'd probably be shocked to learn she was a day over 70. I love hearing her fascinating stories about having a husband in the service and raising a baby during the middle of WW2 - long train rides to meet her husband, sleeping in train depots with a baby in tow (who wore cloth diapers, by the way. Can you imagine??). At that time, men in the army were given priority on trains, which would often leave no room for Grandma and her baby. On more than one occasion, a very nice man in uniform would pretend to be her husband so that she could get on the train to meet Ben, her real husband. Her philosophy has always been make do or do without, and she keeps and immaculate, beautiful, delicious home. And her quilts - simply amazing. I can not adequately describe the perfect, tiny stitches she has spent many years perfecting. She is truly a special individual, and one I feel incredibly blessed to know and be related to, even if just by marriage. 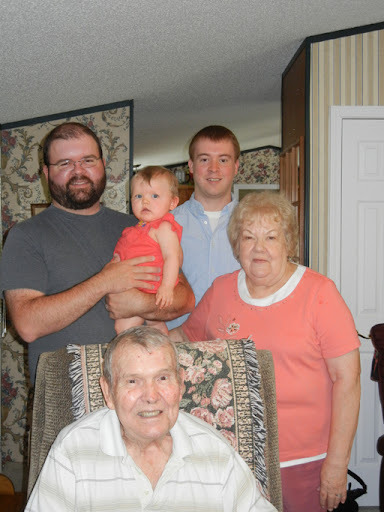 We also got the opportunity to spend time with Grandma and Grandpa Dodd while on our trip. I am so glad Isabel got to spend some time with Grandpa. He reminds me so much of Drew and Drew's dad - the mischievous smile, the witty jokes, the twinkle in his eye. Sadly, his health has been fading fast lately, which makes our time with him this week even more special. Drew and I have been incredibly blessed with a strong, supportive line of Godly men and women to look up to and learn from. I have always thought it strange how our culture often looks down upon the old, when really we should be seeking to learn from them. The Bible says that grey hair is a crown of splendor, and that wisdom can be gathered from those with experience. Do you have someone like this in your life? Are you blessed with more than one? What is the best thing they ever taught you?